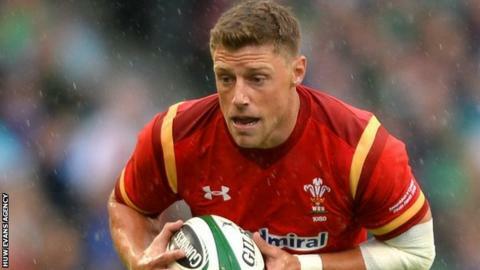 Wales and British and Irish Lions legend Phil Bennett believes Rhys Priestland's 18-month Test sabbatical has ended his international career. Bath head coach Mike Ford announced the news after Priestland's losing Aviva Premiership debut against Wasps. The fly-half, 28, joined up with the English Premiership side following Wales' exit from the World Cup. "I think he knows he's saying goodbye to his international career," said ex-Llanelli star Bennett. Priestland, who has won 40 Wales caps, signed for Bath this year after 10 years playing for Llanelli-based Scarlets. He was first choice at number 10 for Wales under Warren Gatland at the 2011 World Cup. But Ospreys' Dan Biggar has become established in the position. Bennett, who captained Wales and the Lions during the 1970s, says Biggar's status may have helped persuade Priestland to take the unusual step of forgoing international rugby. "My first reaction is not one of great shock really… he's probably thinking 'I didn't take part a lot in the World Cup; Dan Biggar was the main man'," Bennett said. "And I think Dan Biggar now is one of the top three fly-halves in world rugby, he's become a truly outstanding player. "I think Rhys is thinking, 'what do I concentrate on?'. "And by him declaring himself unavailable for Wales for 18 months, I think he knows he's saying goodbye to his international career." Bennett believes New Zealander Gatland will now look to versatile Cardiff Blues pair Gareth Anscombe and Rhys Patchell as challengers to Biggar, along with Bristol's Matthew Morgan. "Gatland will say, 'we're going to move on without you'," Bennett added. "And you're looking at Patchell, Anscombe, Matthew Morgan etc fighting for a crucial position at number 10. "But it is a massive decision [by Priestland]." Gloucester's vastly experienced James Hook and Priestland's fellow former Scarlet, the uncapped Owen Williams of Leicester, are also potential picks in future. Bennett believes the criticism Priestland has faced on social media must be taken into account. "I don't think people realise the abuse, the stick he's taken on... Facebook etc… and I think it's all played a part, probably, in his decision," said Bennett. However, Bennett says Priestland's absence, added to Anscombe and Patchell having yet to fully establish themselves at Blues, leaves Welsh domestic rugby with only one "outstanding" fly-half. "We're looking at possibly just one outstanding fly-half in Wales and that's Dan Biggar," said Bennett. "So good luck to Rhys Priestland. I think it's the end, possibly, of his international career, but [we're] losing a fine player."